Scientists can have a rather odd sense of humor. Take, for example, the chemistry professor demonstrating to his class how strong a beaker full of acid is by using it to dissolve a spoon. Then, a minute later, he absentmindedly grabs the very same beaker which he left sitting next to his glass of water and starts drinking from it—much to the horror of his students. Miraculously, though, he is unharmed. What just happened? Well, the acid was really just a cup of hot water. And the spoon didn’t really dissolve, it just melted and formed a metallic puddle at the bottom of the beaker. You see, the spoon was made of gallium instead of steel. And gallium (atomic number 31) has a melting point of only about 30 °C (85 °F)! Crystals of 99.999% pure gallium. Gallium is primarily refined for the electronics industry, and 98% if the gallium consumption in the U.S. is for the production of semiconductor materials for electronic components such as integrated circuits. Gallium’s boiling point is very high, approximately 2,400 °C, which makes it the ideal substitute for mercury (which boils at 357 °C) in high-temperature thermometers capable of monitoring the core of a nuclear reactor. The largest amount of gallium ever collected was for the neutrino detector at the Baksan Neutrino Observatory in Russia. This detector contains over 50 metric tons of pure liquid gallium and is located 3,500 meters underground to shield the experiment from cosmic rays. It is used jointly by Russian and American physicists to detect Solar neutrinos—ghostly particles that rarely ever react with matter, and pass through the entire earth without leaving a trace, But at this detector they will occasionally cause a few atoms of gallium to change to germanium which can then be extracted and measured. These low-energy particles, made by the main fusion reaction that provides the Sun’s energy, have not been observed in any other way. Many measurements of solar neutrinos were made this way, and from this data scientists have discovered a large deficit of neutrinos from what is mathematically predicted by the Standard Solar Model. Looks like the joke is on them. 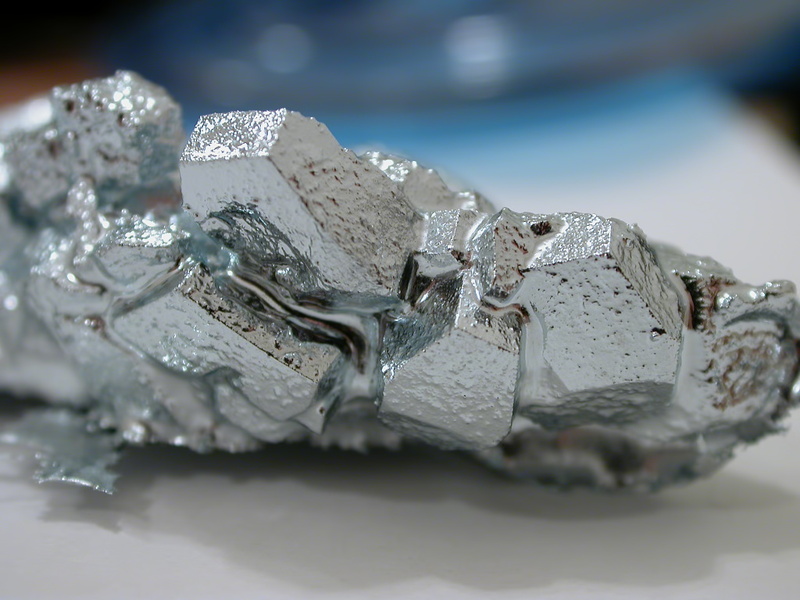 1) True or false: Gallium is solid at room temperature. 2) Gallium is often used in the production of ______________. 3) True of false: The gallium neutrino detector at Baksan confirms the Standard Solar Model prediction on neutrinos. 4) If a neutrino reacts with an atom of gallium, it cause it to change to ______________. 5) The main reaction that provide’s the Sun’s energy is called ______________.